Reasons of huge influx of customers on Walmart? How to sell on Walmart.ca? Walmart.ca is an e-commerce arm of the World’s largest retailer - Walmart. It is based out of San Bruno, California. The Walmart.ca imbibe the same philosophy of its retail business of providing everyday low deals while placing customer’s need at the forefront. Currently buyers can shop from its 1,000,000 high quality item catalog. Walmart is a household name worldwide. The scale of its penetration can be best understood from the fact that 96% of U.S. population live within 20 miles of Walmart.ca. And each week 240 million people thronged to its stores worldwide. Thus, it was natural that its e-commerce store will attract eyeballs. The Walmart’s retail avatar is a clear winner. They offer great deals - everyday deals - which is hard to replicate by any other competitor in the e-commerce vertical, obviously the exception does exist. Walmart is now doing online what it has mastered offline. Dozens of study indicate that delivery time can make or break the game for any e-commerce company. Here Walmart.ca scores big. It allows free 2 day shipping on its products if the order value is more than $35, that too without any membership fee. This also becomes its strongest point. Due its great supply chain management and its strategic locations, customers can order online and then pick them up in their nearest Walmart stores (not all products) which enables customers to get additional discounts as Walmart passes the shipment benefits to customers. Does it need to be said? Walmart.ca is a one stop shop destination for buyers, customers can almost find all of the things at their website. This makes people with all sorts of interests converge onto Walmart.ca. With Walmart being the largest retailers of the world, it has built a great infrastructure for its online vertical as well. And the CEO Dough McMillon purchased Jet.com and anointed Marc Lore to lead its E-commerce vertical shows that it means business. Additionally due to its already expansive network it has a great support for selling. From Inventory management and tracking to tax collections (an exhaustive practice as to ship product in California different taxes are applicable to different zip codes) and great and friendly customer grievance redressal system, everything else has been taken care of by Walmart.ca. All you need is start selling on Walmart.ca. When it comes to new customers, they are much more comfortable buying from the an established name rather than visiting new website (all due respect to the marketing efforts you put in). The gravity of the success of Walmart’s online vertical can be measured only by the fact that back in 2013 itself, Walmart was just behind the market leader Amazon. The Walmart.ca has invested heavily to ensure that visitors coming to their website have faster page checkouts and effortless Transactions. The same benefit you get by selling on Walmart.ca. Whenever your potential customers find your products on their platforms then the entire process of adding the products to cart to payments is seamless. Walmart.ca offers tools that help to track performance, provides insight that offers great value to acquire more sales. Since Jet is a new marketplace, it has lower no. 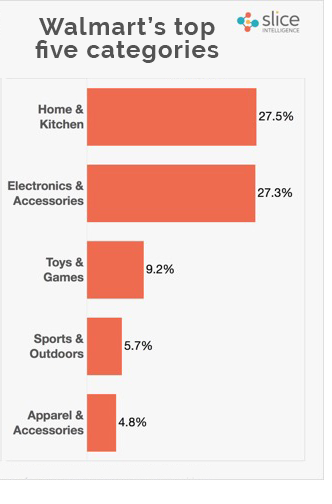 of competitors than other popular marketplaces than eBay and Amazon. Thereafter once you get approved you can choose from either of the methods. The Seller Center methods require lots of manual work as mapping and creating product profile is tedious. Whereas, in the API based method, seller can either sell through SaaS based inventory and management systems or by integrating their online websites with Walmart which automates the selling. Always prefer channel integration partner these companies are constantly in touch with Walmart executives hence share a great rapport, which will not only help you get accepted, but afterwards all your critical and menial jobs will be preferential because Walmart gives high priority to its partners.